New York Times Most Popular Home. Photo by Michael Horne. 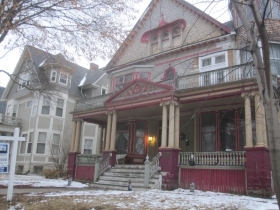 The most-viewed property for sale in the New York Times “Find a Home” series in February was a $190,000 Queen Anne located on W. State St. in the Concordia neighborhood of Milwaukee. Its sales price was less than a tenth of each of the four runners up, all located in New York City, which may explain the home’s apparent novelty value for readers. But there’s more reason than that to admire the home. Visually, the place is a stunner, with traditional High Victorian details (always in abundance) dressed up in Teutonic flourishes, such as a helmeted turret that calls to mind elements of the Germania Building. Both buildings were designed by the team of Herman Schnetzky and Eugene Liebert, who were active in the immigrant German community. 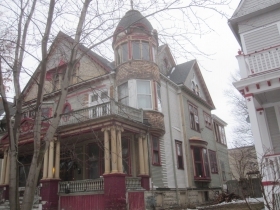 The New York Times restrainedly called the home an “unconventionally decorated Victorian in Wisconsin priced at under $200,000” in its report on the popularity of the story. From exterior observations, and from interior shots as seen in real estate advertisements for the property, the home is also incompletely finished, since you’re never done working on a place like this. A pile of lumber on the side of the building is testimony to this state of affairs. And the old wooden siding soaks up paint like you can’t imagine. Still, any work is welcomed by these old Painted Ladies, and the neighborhood is somewhat shinier for the efforts of the new generation of homeowners who have settled in this area. The residence was built for Charles Gezelschap (1860-1933), who sold lighting fixtures from a store on what was then 3rd St. It is now the site of a George Webb‘s restaurant. Given the owner’s profession, the home probably was better outfitted with electric sockets than was customary for the time. 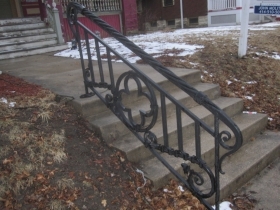 In 1910 a small addition measuring 9-feet by 12-feet x 10 feet was tacked on to the structure at a cost of $200. In 1915, Gezelschap paid another $200 to have a garage built on the property. Like many of its peers, the home rapidly devolved into a licensed rooming house. It had 11 units and 2 sleeping rooms in June 1963. In October 1965, an inspector noted that the building lacked a fire alarm, and circulated a memo to that effect within the city bureaucracy. His report received this reply: “NOT required. Only 15 persons in bldg.” Only 15? The home was owned by Eleanor Hoffman, an absentee landlord, who sold it in 1971 to James Turner, who encountered wiring problems, and who knows what else in the place. The home came into the hands of Roman J. Lisowski, Jr., who then sold it to H. Hasso Kuehn and Heinz M. Scherzer for $10,000 in 1974. Scherzer got the place outright by 1978, and held on to it for another 20 years, selling it in 1998 to Pamela Menefee for $60,000. She sold it for $142,500 in June 2000 to Dominick Gilbert and Dimitri Gilbert, who financed the purchase with easy money from Deutsche Bank National Trust. By September 2001, the home was in foreclosure. It sat vacant, getting none the better for it. 1892 Queen Anne “Mini-mansion” on a double lot in the Historic Concordia Neighborhood. An outstanding house on a street with many carefully restored homes. This house has a new roof and gutters, rebuilt chimneys, rebuilt front porch and repairs to siding and trim. Five years later, in June 2015, it was purchased by Kyle Kompas and Nicole Vurusic, the current owners, who paid just $22,000 for the pile. At that time the home was boarded up, and much work needed to be done. 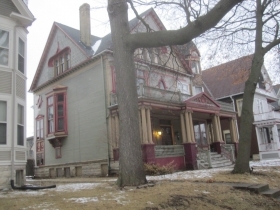 The partners set to work, and are probably still at it, but the home’s rooming house days are long in the past as homeowners have returned to the neighborhood to stake their claims to a remarkable corner of Milwaukee. The home was listed for sale in February 7th 2018 with an asking price of $199,999. The price was dropped to $190,000 on February 13th. An offer for the property was made on February 20th, but the property remains actively listed, presumably to attract a larger offering price. The purchaser will encounter a neighborhood starkly different from the rooming house days, as the slow recovery from the housing crisis continues and as a new generation discovers the joys of living and entertaining in impossibly large and grand circumstances. The area’s Democratic state representative Evan Goyke is among that group, and we visited his home in April of last year. The Historic Concordia Neighbors, Inc. has an active Facebook page and an array of activities for residents, including a recent “Game Night,” a fun way to meet new friends and to strengthen neighborhood cohesion. The group has also had considerable success showing off the progress that residents have made (often quite incrementally) on improving their homes and gardens by hosting an annual tour. The Historic Concordia Tour of Homes 2018 will take place on June 16th. 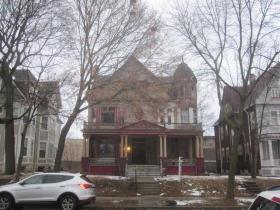 Description: Robust residence vies with others on awakening stretch of W. State St.
Polling Location: Milwaukee Academy of Chinese Language School 2430 W. Wisconsin Ave.
How Milwaukee Is It? 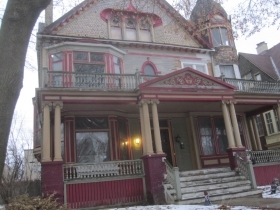 The residence is about two and one-half miles west of Milwaukee City Hall. Thanks also to to Common Ground who stood in front of this building in the Foreclosure crisis to note the complicity of Deutsche Bank in the crisis. It is glorious to see this restoration and to see the national recognition given to efforts in Milwaukee that bring life to neighborhoods. It’s possible that the Hoffman owner mentioned was a descendent. Gezelschap and Hoffmann families were connected, along with the Kalvelage family from that neighborhood. I s’pose maintaining that property and an Oconomowoc Lake home would’ve been taxing; a Miss Mathilde Gezelschap passed away out there in 1919. One member of the family left the US to live in Germany at some point as a later Chas. Gezelschap in Bremen placed notices for his wife Emilie in Milwaukee’s German language newspapers. The family’s all gathered together at Forest Home Cemetery. There must’ve been forgotten Gezelshchap family connections back in Germany as someone used law offices in the early 1901s to search out heirs of a Karl Gezelschap. “Milwaukee’s German Newspapers; an index of death notices and related items” (1844-1950).